Jackie Fo: Misty and Jared Wedding Photos! Yea, it's Friday! And I have a free weekend...and I plan to be straight up chillin' yo... Awesome! Let's talk a little about how lucky I've been to have such sweet brides/grooms/families to work with on my marathon of wedding coordination I handled this fall. Misty and Jared were no exception - they are seriously so SWEET and were so excited to marry each other. Loved them! Misty claims she's not good at this type of "planning" stuff, but she seriously rocked! 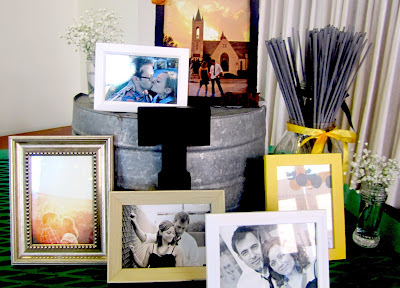 She was so organized and had these great ideas that came to life beautifully. I'd hire her ANY time! 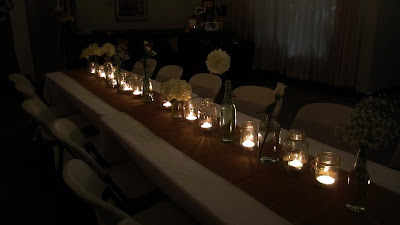 The theme was romantic and rustic, with tons of candles, white flowers and that awesome burlap I have seen so much lately. Their wedding was at the Trolley Museum, where I do a lot of my events. Let's take a look, shall we? How cute are they? 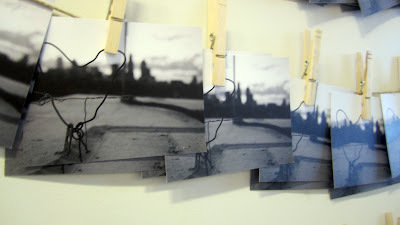 Check out their photos below. 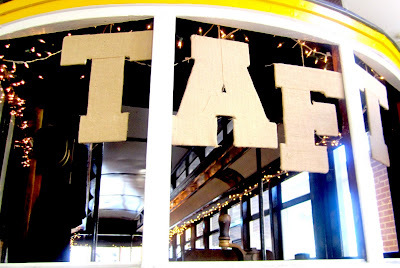 Their new last name will be Taft, so Misty made these awesome burlap covered letters she hung from inside the trolley. I loved their favors so much. One of their friends took this really neat picture of the Charlotte skyline and they made them in to postcards for everyone to take home. Let's talk flowers and glass jars. Misty had a vision in her head that involved all white flowers, greenery, tons of candles and many, MANY different sized glass bottles and jars. 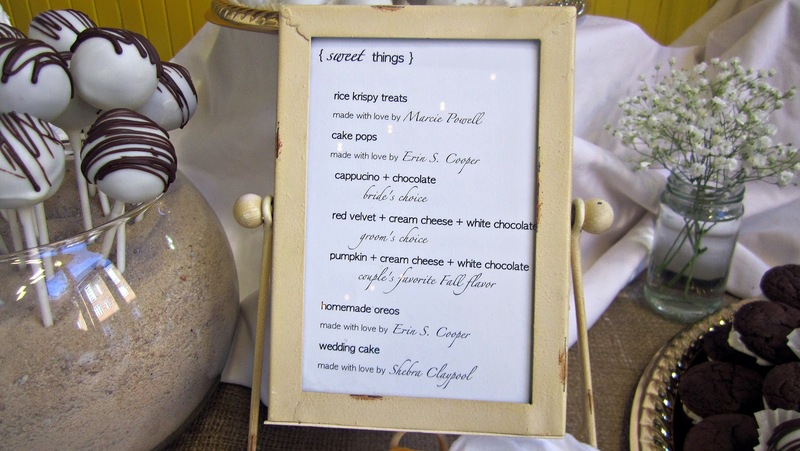 We did several mock-ups of the table, and I think they turned out so pretty! They looked so great at night. If you like this idea and are planning a wedding or event, start collecting glass jars! Wine bottles, peanut butter jars, everything that's glass works! 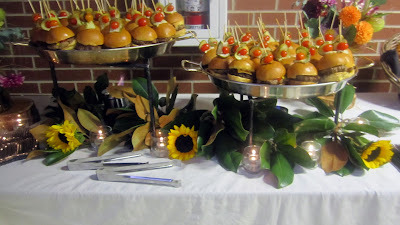 They used Plate Perfect catering, and if you are in Charlotte, definitely check them out. They are awesome! They own restaurants Mama Ricottas, Cantina, Big Daddy's, Midwood Smokehouse and more! Their food displays are always pretty and they are great to work with! Misty and Jared's friends were so helpful, it was really sweet. They made her entire dessert table, and it was wiped out by the end of the night! People LOOOOVED these desserts. 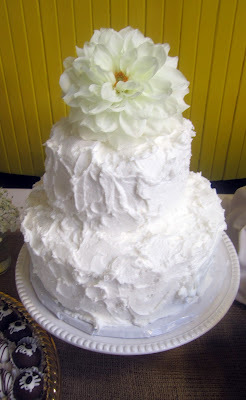 I loved the simple white cake. The cake pops were displayed in bowls filled with sand. Very clever! A final shot I took from above. Misty and Jared, you guys were such a pleasure to work with! Congratulations and Best Wishes!!! Beautiful event! Love the cake pops in sand - I always struggle with how to set up pops, I'll have to remember that! Everything about this event was so sweet & rustic. Loved it. Jackie, you did a great job as well! You made it so much easier for us to have a great party. And you're right, Misty and Jared are awesome and love each other so much. Beautiful wedding, love the chalkboard! beautiful wedding! i love that cake too! Very pretty! 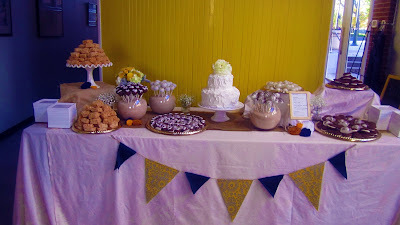 Love the burlap table runners and the burlap covered letters!